SculpSure is now FDA-cleared to reduce fat under the chin. Even with diet and exercise, most people have stubborn pockets of fat that seem impossible to lose. SculpSure’s technology is able to target and can destroy the targeted fat cells safely in just 25 minutes without affecting the skin’s surface. There is no recovery time following treatment, so you can resume your daily activities immediately. Most patients need multiple treatments to achieve optimal results. We find that our patients get the best results for submental (double chin) fat reduction when combining few treatments. There are many treatments to reduce submental fat. However, we concentrate on making the whole area look tighter, smoother and more lifted. 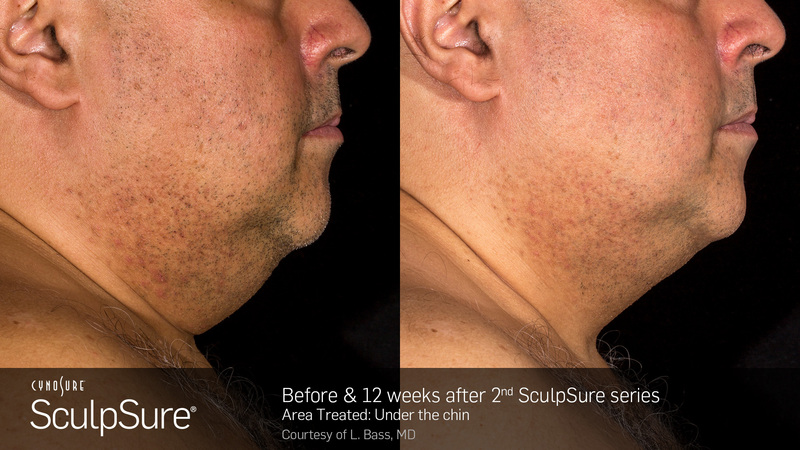 While there are other options, SculpSure is our choice for treating the double chin. We can combine that with Ultherapy and Botox. Ultherapy helps tighten the skin in the area. Botox reduces the wrinkles around the neck area. This will give you an improved, natural appearance of the double chin area.